You sure have been busy!!!! I am back and I'm trying to catch up with everybody... I am going to catch up with your work now and I will leave comments on the pots that move me most. 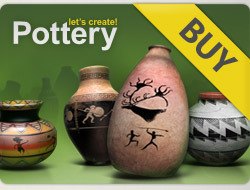 Thank you for coments and voting for my pots. 5***** for 3 latest new fantastic creations. Thank you for supporting "Jan Trifan " gallery, dedicated to my Grandfather... He passed away 2 days ago, at age of 101 years 8 months and 26 days! God bless his soul! Thank you once again!